press con gif: tennis match? GuiGui gave a ride to all the boys/guys back to Taipei, after filming Pi Li MIT for the day. 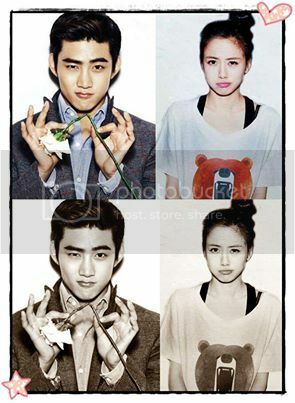 Taec & GuiGui - photos I've not seen before but perhaps posted here before? chatter: what is she wearing? why did she choose to draw a smiley face with OkCat green font? Love this part...Wooyoungie teaching Gui Gui the "correct" way of dancing "10 points out of 10 points"...hehehe. He was so serious about it too... Gui Gui's way is adorable though. Nov 15:OkCat asks "who do you think of when the first snow falls"
chatter: why are there hearts in the picture? who is OkCat thinking of? Taec asks Guigui to call him Oppa.. Describe your wife with a song title? 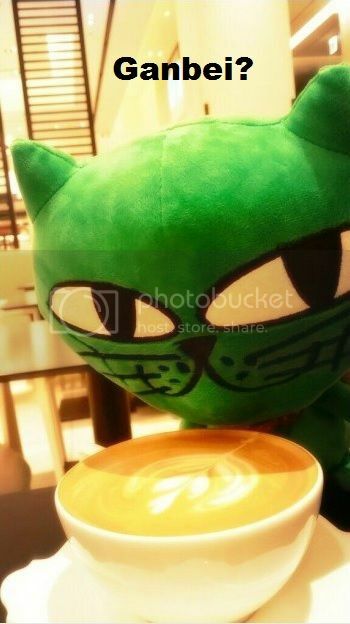 chatter: does okcat want to skip work after what the troll the previous day? chatter: why is there some Chinese included in a korean tweet? Nov 13: Taec tweets this song, "Don't judge me"
chatter: omo, what are these lyrics a reference to? how did the thread react to GuiGui's prank? Post 1: GuiGui updates that Edwin, her co-star from slacker food diary, and her "cherish each other"
Post 3: A while later, OkCat updates "OkCat is crying"
I'm posting this just to show how close TaecGui sat next to each other during the interview at GWGM PressCon. Taec's pics to promote his movie Marriage Blues appeared in the magazine High Cut. This is the Photoshopped version. costar comments on Taec, "he is a bad guy"
More gifs from Global WGM PressCon - different angles and takes. chatter: the tweet includes the phrase " Wouldnt it be nice if we can walk hand in hand till the end of the roads..."
Nov 11 -- is okcat sick? all wrapped in a blanket? 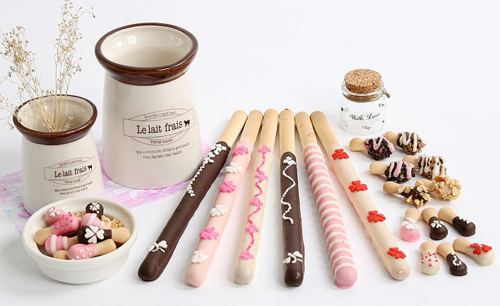 This was OKCAT going out to the Gangnam Station area today passing out Pepero for Pepero Day, 11/11 (a made-up "holiday" by Lotte). Global We Got Married PressCon's photo versus Marriage Blue PressCon's photo. See any difference folks? I love these two soooo soooo much that I made another mv with the song, "Are You Still Waiting" by Hee Young. It's the English version from the "Lie To Me" OST. I think it's more appropriate for the title to be, "Are We Still Waiting". At least, I think that "We Are Still Waiting" to see TaecGui together as a real couple. Nov 8 -- Is OkCat shopping for a gift? 'Lee Mija & Friends Concert" 2PM talking to MOFAKR officials in the evening. Nov 4 -- Taec personally stuffing OkCats into the free kits for high schoolers taking their college entrance exams. Nov 5: Taec promotes the quirky song titled, "where did you sleep last night?" 2 days ago he tweet this..
costar comments on Taec, "not affectionate"
commentary: Taec: "my heart hurts"
What say you when it was Taec's turn to try and make Guigui laugh? Upcoming Movie "Marriage Blue" OST Music Video release! chatter: who is that standing behind her? IF you’re the only one who can make a guy like him unbend, if you can make him laugh with you when he’s all that serious and frown-y, and if he describes you as a ray of sunshine that just entered the building (remember Taec? ), THEN you know that you’re the special one for him. Winning over a guy like him is "more satisfying" that winning over a guy who carelessly gives out his affection to everybody and anybody. chatter: wait, what is the bus no that OkCat is riding? chatter: why cat? why not something else? What’s their dream marriage like? What do you think of Korean men? Who is more attractive, TY or HK? Impressions of Korea. What do you find attractive about TY? What's your first meeting like? Who do you like more, TY or NK? What attracted you most about TY? 2nd Batch - I like how TY breaks/bends their house rules for GG. @packmule3 you need to catch up soon! The season of yearning for a lover. Won’t you get warm with us? The Lead Actors are 2PM! I was just now writing my comments on the short interview as posted by @angelangie two days ago, but I think I’ll attach my post to your comment instead. Here’s @angelangie’s comment for reference. chatter: at the same time? is it just coincidence? What made GuiGui cry in Star Knows My Heart? What made GuiGui cry in Star Knows My Heart recording. I like how TY breaks/bends their house rules to rescue the damsel in distress, GG. GG abiding to the house rules, didn't ask for help from TY when she was struggling, but TY being the gentleman that he is, offered to help her out! PDnim and crew were on the bus! 2PM is releasing “Winter Games” on October 16th – a winter-themed song they’ve made for the first time. Having met them again after 8 months, we had a talk about the new single and members’ solo activities, as well as impressive winter dates wearing trench coats, and each member’s real “love”! Another pic of Gui Gui as a bridesmaid...so beautiful & so cute! i do really miss this couple. they are cute and perfect at same time. This is my favorite TaecGui moment. The question reporter asked Taecyeon is: " What you gonna do when you go on a date with your "trench coat style"? " Congratulations Taecgui shippers, we've reached 1000 pages!!! Yay!!! I'm first on the 1001 page!! getting out of the water.. "I am cold!" [gif] "10 jeom manjeome 10 jeom!" Thank you to everyone who has contributed (even lurkers)! And we won't stop...many more pages to go! Taec & Gui Gui...we love you! ...and really hope you two love each other too! Woohoo...let's all dance to "10 jeom manjeome 10 jeom!"